This Canon EOS C200 Cinema Camera and Triple Lens Kit includes the Canon C200 camera body and three Canon EF USM lenses, to create a versatile digital cinema production kit. The three lenses included are the EF 16-35mm f/2.8L III, EF 24-70mm f/2.8L II, and EF 70-200mm f/2.8L IS III. Canon's EOS C200 EF Cinema Camera features a built-in EVF, 4" LCD screen, top handle, Super 35mm CMOS sensor, and Dual Pixel Autofocus. The EF lens mount on the EOS C200 offers compatibility not only with Canon's existing broad range of DSLR lenses but also with their line of EF-mount CN-E cinema prime and zoom lenses. The Super 35mm sensor is paired with Canon's Dual DIGIC DV 6 image processor, allowing it to capture and record up to DCI 4K resolution. The C200 can also record Canon's Cinema RAW Light internally via its single CFast card slot. The camera also incorporates two SD card slots for recording UHD 4K/HD MP4 video. A built-in EVF enables the camera to maintain a small footprint when you shoot. However, the included removable 4" LCD screen as well as the included top handle and camera grip make this camera versatile for larger shoots. You can output video via the camera's SDI output, and the built-in XLR connectors provide two channels of audio at line, mic, and mic+48V level. A built-in Ethernet connector provides input/output control. This codec allows you to record raw data internally to a CFast 2.0 card via the camera's single CFast card slot. The CFast card slot enables capturing DCI 4K in Canon's Cinema RAW Light format. UHD 4K and Full HD recording onto SD cards is available via the two SD card slots. Box Dimensions (LxWxH) 18.4 x 14.4 x 12.8"
Box Dimensions (LxWxH) 9.4 x 5.4 x 5.4"
Box Dimensions (LxWxH) 12.6 x 7.4 x 7.2"
EOS C200 Cinema Camera and Triple Lens Kit is rated 4.0 out of 5 by 44. Rated 5 out of 5 by Chris from Don't listen to the haters. :) I always see a ton of people complaining about the lack of 10-bit... but it HAS 10-bit and even 12-bit if you want to record to C-fast cards (which are cheap compared to RED media). ?However, we use the 4K 24P and 60P settings in 8-bit all day, every day. ?Straight to SD cards, which are cheap. ?I notice about a 1-stop loss in dynamic range compared to recording in RAW, so for 95% of the stuff we do, it's fantastic (corporate, brand, social, tons of interviews + b-roll). ?And if we need an extra punch, we switch it to RAW for a few shots. ?Built-in ND's, touch screen autofocus is amazing, easy to go handheld, and reliable. ?Incredibly reliable. ?We have 4 of them. Rated 3 out of 5 by Jeff from Lacks Standard Processional Codecs After own this a week and shooting various projects from commercials to documentaries I feel what others are saying. When a 5DIV and 1DXII have better codec options for much cheaper really makes you wonder why they crippled this camera. Either you can shoot Raw light or basically an equivalent to Avchd with there MP4 options. The Engineers, Marketing and Management at Canon need to wake up, respectfully. They have a chance to truly crush the competition by adding 1-2 basic 10-bit 422 codecs. Overall I feel this camera in terms or design and build quality beats the other cameras in its price range hands down! However with its light everything codecs, I would only recommend this camera to a very few. Rated 2 out of 5 by Tom from Great Possibilities, depends on the firmware update So much about this camera is right. The color science, the auto focus and Canon build quality. However, what we need is a 4.2..2 10 bit codec and the ability to output both this codec and the 4k 60 raw output to an external recorder. A single cFast slot is not a practical or affordable workflow. If the firmware gives us a 4.2.2 10bit and the ability to output 4k 60p raw to an external recorder, I believe this will be one the great selling cameras of all time. Without these it is just another example of why so many loyal canon shooters have had to go with other companies cameras. Rated 3 out of 5 by mike from Needs a 10 bit codec This could be a great camera.? But no 10 bit recording option is a big deal.? what's equally troubling is that Canon is not listening to the people who actually buy and use their cameras.? Panasonic and Blackmagic both have cameras in this price range with the proper codecs, and histories of providing firmware updates to empower their users.? on the other hand it seems Canon is withholding crucial functionality as some kind of marketing ploy.? As a camera manufacturer in today's competitive market this is a very dangerous way to think. Rated 3 out of 5 by dave from A near perfect camera... After seeing the early reviews of the C200 and its beautiful raw image, I decided to sell my C300 Mark II. Unfortunately things didn't go as planned.? While the C200 has nice ergonomics, amazing autofocus and a great raw image, its 8 bit 4:2:0 codec is unacceptable for a modern $7500 cinema camera. In my experience the 8 bit image was surprisingly soft and produced heavy aliasing on numerous occasions. ?I didn't think it would be an issue but it was. With the Raw workflow being very cumbersome, it's just not feasible for a lot of the paid work I do.? After trying the Panasonic EVA1 and C200 side by side it became apparent just how inferior Canon's 8 bit image is. The EVA1 blew it away and also held its own against the Canon Raw image. While I much prefer the ergonomics, menu system and autofocus of the C200, the image quality was ultimately what won.? Sadly I am one of many who has decided to move on from Canon for the time being. They make some great products but their ethics and self crippling of their own line finally became too frustrating to support. I'm sure the C300 MKIII/C400 will fulfill the potential this camera had but at at least double the price. Rated 3 out of 5 by Dru D. from I might have gotten a dud. I have a lot of reddish noise no matter what I do. I perform the ABB, adjust the exposure, change log - nothing seems to really help. It's always there, sometimes worse. I called Canon and we are sending it in for service. I hope they find that the sensor is bad. The footage people are putting up on YT is amazing, even the low light stuff. ISO 800 for me is way too much noise; people are using it at 3200-6400 and getting good results. I will update once I get it back from Canon. Rated 4 out of 5 by mason from Is it perfect? No, but no camera is I own this camera along with a 1DC and a 1DXMKII, i use them all for different things, and I love all of them. I do hate that cfast is so expensive but EgoDisk, ProGrade and AngelBird all make great and more affordable media. I use FCPX so I dont have to worry about transcoding or any of that, which is what many people complain about. 4k60 is epic on this thing, its sharp and actually at times I feel this camera can be to crisp. I love the color, I love the autofocus, the only thing i wish it had was 4k120. Battery life is amazing the view finder is great, I really enjoy this camera, i chose this over a red scarlet. The reds are great but this thing is so easy and it will last all day on canons bigger battery. Are the pl sigma high speed lenses compatible with this camera? Asked by: victor manuel c.
Yes, Sigma PL Mount Lenses will work with the C200. YES. the Cable is Long enough too. you just need a magic arm or clamp of some sort. Can you record 4k mp4 and HD mp4 to different SD cards at the same time? I'm afraid not. You will not be able to record a 4K MP4 on one SDXC Card and an HD MP4 on the other. However, you can record 4K Cinema RAW Light to the CFast 2.0 card slot and a Proxy 2K File on to SDXC. Will the top handle from the C300 Mkii work on the C200b? 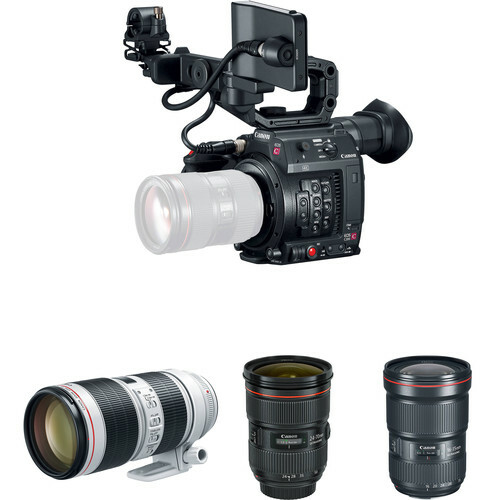 Canon improved the C200 top handle and it is our understanding that the C300 handle is incompatible. Will the C200B fit on a Ronin M? I have the Regular C200 and It fits on the Ronin M but you will need the Counterbalance accessory kit from DJI its Like 200 bucks. Can I shoot UHD or FHD in Raw Lite? The C200 when recording RAW Light is 4K only. Will you be able to sync timecode through the sdi on the back with other cameras? Sorry the C200 while it has timecode you can set manually, it does not have a Genlock. Is the camera weather sealed ?